A.W. 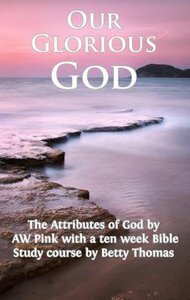 Pink's The Attributes of God is a classic that presents the seventeen attributes of God in a way that is accessible to the less-experienced reader as well as providing enough for those with deeper familiarity with Christian literature. This is our God as Scripture reveals him, and it is vital that we have this understanding and not an image of God from our own imagination. Reading this book will warm your heart and enhance true worship. The Bible study published in Our Glorious God was written to help the reader more fully grasp and appreciate A.W. Pink's book. It includes the reading of Pink's chapters along with five days each week of biblical sections that highlight God's praiseworthy qualities. As Charles Spurgeon notes, the proper study of a Christian is the Godhead ...the name, the nature, the person, the work, the doings, and the existence of the great God. J. I. Packer says that the study of God's nature and character is the most practical project that anyone can engage in. Elizabeth Marshall Thomas is a noted anthropologist and is also the author of "The Hidden Life of Dogs" (Pocket 1996), "The Tribe of Tiger", "The Harmless People", "Warrior Herdsmen", & the novels "Certain Poor Shepherds", "Reindeer Moon", & "The Animal Wife". She lives in Peterborough, New Hampshire and the Boston area.